I’m a day late with the baby journal update this week but we’ve had a busy weekend. We took our first cross-country trip as a family of four, heading to Limerick for my mother’s birthday, and just returned today. I was a bit worried how Little Woman would cope with the long car journey, but thankfully she slept for the majority of it, and we just stopped for one feed on the way. The past week has been a great one. On Saturday night, Little Woman slept for 5.5 hours straight. On Sunday night she slept for 6.5 hours straight and then on Monday night, she slept for just over 7.5 hours, falling asleep at 9.15pm and not waking until 5.50am. Of course the sleepy trend came to an end on Tuesday night when she woke for three feeds during the night! Talk about a shock to the system! It was just a blip though because since then we’ve returned to one feed a night, which seems perfect to me. I think that excessive windiness may have caused the wakefulness on Tuesday night, because Tuesday evening was the first time I tried feeding a bottle of expressed milk to Little Woman. I expressed it first thing in the morning, getting 3.5oz in about five minutes following her epic sleep. It took me all day to work up to giving her the bottle though. I’m not sure what I thought would happen, but I guess it was just playing on my mind that Little Man developed such a preference for the bottle, which I think exacerbated a lot of our feeding problems. I needn’t have worried though. No bottle preference here. It took a few minutes for Little Woman to drink anything from the bottle. At first she just looked at me in disgust and refused it. Eventually she drank some, but she choked easily on it and I had to be really careful. I tried to follow a paced feeding approach, because I’d read that it helps to prevent babies developing a preference for the bottle, but I think all I succeeded in doing was filling her with wind. It took 20 minutes for her to drink 2oz. By that time the milk had cooled down and she had no interest in it. For now I think we’re safe with our efficient and hassle-free five minute breastfeeds. We’ll try a few expressed bottle feeds again next week and see how we fare. This has been a really enjoyable week developmentally. Lots of smiles and even the occasional giggle to enjoy. I can see a definite improvement in her head control, now that I’m giving Little Woman regular tummy time at intervals during the day. I also think there’s a slight improvement in the shape of the back of her head. It’s still flat on one side, but less noticeable than before. Her neck seems to be loosening up though and now she is happy to look to the left as well as the right. I think that alone will help her head to reshape in the months to come. 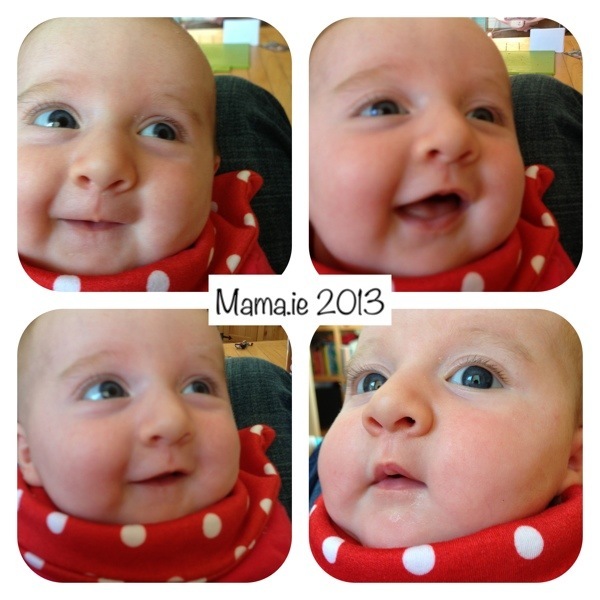 Those photos could be a post all on their own…She looks like she’s going to sit up and tell a story! She is so cute. Oh she definitely gives me the impression that once she starts talking she’s not going to stop! She’s always babbling away, cooing and gurgling. It fascinates me because Little Man wasn’t much for making a lot of sounds at this age – not that I remember anyway. Your bottle story sounds very familiar to our one except ours ended at the “looked at me disgusted” part! After several attempts we just had to give up. On the plus side, we avoided the weaning from a bottle stage. Swings and roundabouts! Mind the Baby recently posted..The little emperor has spoken!